King of the Chazars, who in 620 embraced Judaism. Joseph, "Chaghan" (king) of the Chazars, in answer to a letter from Ḥasdai ibn Shaprut (960), informs him that 340 years earlier one of his ancestors, Bulan, became ruler of the Chazars. To him the Lord appeared in a dream, promising him might and glory. Bulan went by the Daralan road (Caucasus) to Aradavil (Ardebil), the capital of Adherbaijan in Armenia, and gained great victories. He then determined to adopt the Jewish religion. The Byzantine emperor and the calif of Ismael each sent to him deputations with valuable presents and wise men versed in religious matters to convert him to their respective religions. Bulan summoned wise men of Israel also, and examined them all. 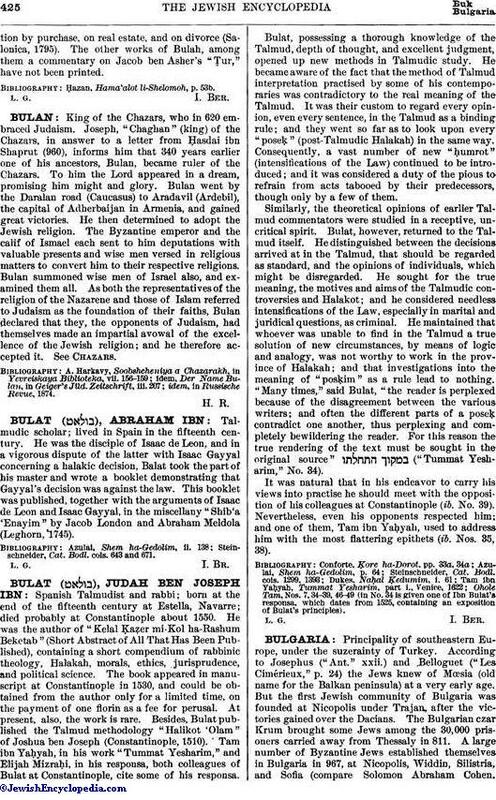 As both the representatives of the religion of the Nazarene and those of Islam referred to Judaism as the foundation of their faiths, Bulan declared that they, the opponents of Judaism, had themselves made an impartial avowal of the excellence of the Jewish religion; and he therefore accepted it. See Chazars. idem, in Russische Revue, 1874.